Cahokia was dubbed the "City of the Sun" because of an interpretation, that a sixty degree angle between the azimuths of the four summer and winter solstice rise and set points determined Cahokia's placement. 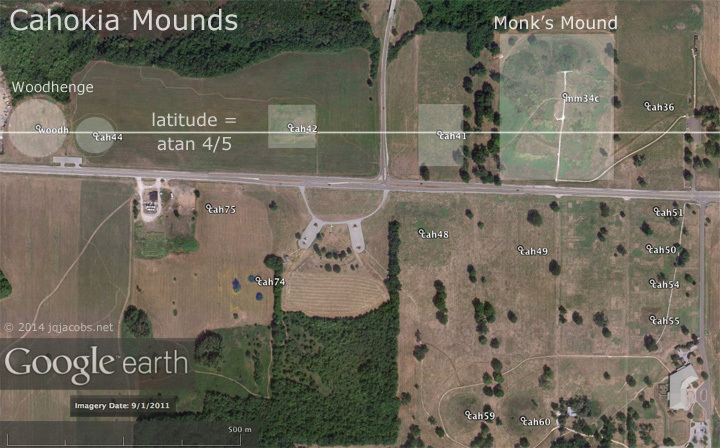 After reading this claim, I determined the latitude of Monks Mound and found the idea to be in error; the latitude with sixty degree azimuth spacings between solstices is quite a bit south of Cahokia. City of the Sun was a misnomer. Woodhenge even implies the Cahokians understood this, as discussed below. Over time, the solstice horizon angles change as earth's oblique rotation angle oscillates. I intended to quantify the temporal change in illumination angles to date the hypothetical placement. I found Cahokia's latitude is significant nonetheless for an entirely different reason. And, the significant Cahokia latitude property is stable over time, with very slight tectonic plate motion only relevant to placement accuracy. Thereafter, I noted other major ancient monuments also situated at latitudes with the same rationale. Cahokia's obvious east-west axis and Monks Mound are situated in relation to a geodetic attribute, the latitude. Specifically, latitude tangent equals precisely 0.80, four-fifths. In other words the site's geodetic axis, the line to the center of the earth's mass, is the hypotenuse of a 4:5 global-scale triangle. The placement of the Cahokia baseline (Figures 1-3) precisely on the 4/5 atan latitude, assuming intention, lucidly communicates the geodetic knowledge and accurate astronomy of the prehistoric Americans shortly before European contact. Figure 1. The atan 4/5 baseline transects Cahokia Mounds. Click image to view a larger file. Download GPS placemarks. Cahokia's baseline transecting Woodhenge, then three intervening major mounds, 44, 42, and 41, and Monks Mound. Woodhenge latitude tangent is 0.800003, Mound 41 equals 0.80, upper Monks Mound 0.800020.
the central section of the largest prehistoric city north of Mexico. the solstice azimuth spans near one-sixth of circumference; the actual latitude of this coincidence is south of Cahokia. to winter and summer solstice sunrises, a wider angle than the centerpoint angle. After noting the geodetic geometry of Cahokia, I determined and converted the latitudes of numerous monuments to trigonometric functions and other geodetic and astronomical modules. One of the oldest known stone circles is at Nabta Playa in Egypt. The latitude placement of Nabta Playa, near one-fourth the distance from equator to pole, could imply intentional latitude placement originates by around 7,500 years ago. Given such early context, less suprisingly some of the largest monuments in the world and earliest major monuments in both hemispheres evidence construction at specific significant latitudes. These selected latitudes imply astronomy is the functional rationale of their geodetic geometry. Given latitude placements are intentional, monument positioning evidences the earliest known precise astronomical and geodetic measurements. Thus, the greatest of ancient monuments evidence a capability of accurately determining latitude spanning the range of their construction and the earliest evidence of astronomical observatories using exact sciences is implied by latitude positioning. Astronomy is essential to place determination relative to the whole earth. Latitude is far easier to determine than is longitude. Geodetic latitude is determined using earth's poles and the celestial poles, extensions of the earth's axis of rotation to two fixed, non-moving points in space. To determine geodetic position the local level and plumb reference frame is compared with the angular position of the astronomical pole. The poles inter-reference astronomical and terrestrial coordinates. At Cahokia, the North Pole angle is the arctangent of five-fourths. The geometry of the angle between the local geodetic and celestial reference frames presents a functional rationale to place astronomical observatories at locations with low-integer geodetic triangles. Monument placement at latitudes where small rational numbers describe the local geometric relationship to celestial motions has astronomical utility. Such placement of observations provides considerable simplification of mathematical operations. With simple integer ratios expressing trigonometric functions, complex math operations are avoided while also eliminating the inaccuracy of decimal rounding. While trigonometric function is a new consideration for ancient astronomy, another latitude property, fractional geodivisions, has received previous notice. 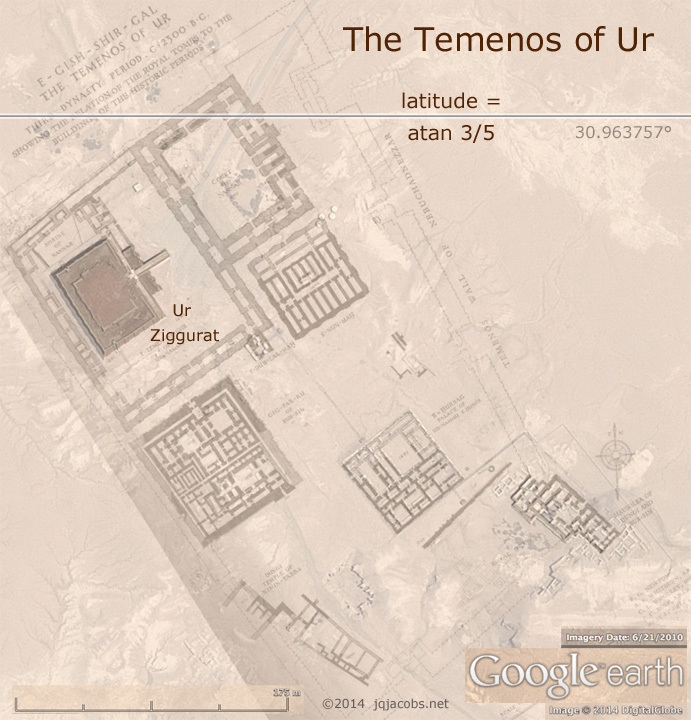 Stecchini noted the latitude at Karnak equals one-seventh the meridian arc and wrote that ancient geographers divided the meridian from equator to pole into seven zones. The latitude baseline equaling one-fourteenth of earth's circumference intersects Karnak, passing between the Mut and Amun Halls. By comparison, the list of Nile monuments closest to similar geometric subdivisions presents large margins of error. The Giza pyramids are several kilometers from one-twelfth of circumference (30.0°), a significant error. Nonetheless, pseudoscientists have toted that relationship as intentional placement related to one-twelfth of circumference. Precise latitude and the accuracy of placement of monuments is only recently relatively easy to determine. In 1984, the World Geodetic System (WGS) established accurate global place determination and point positioning in a universal geodetic reference frame. Current cartography research and study also benefits from recently developed tools and methods. The Google Earth virtual globe has placed high resolution aerial and satellite imagery at everyone's fingertips, along with the capability to create customized placemark files and the graphics herein. Complex geodesy was evidenced in the Neolithic before the great pyramids were built at one-tenth of circumference arc distance from older Newgrange in Ireland. Avebury in England (Figure 4) is accurately positioned at the latitude equaling one-seventh of earth's circumference (360/7 equals 51.4285714), double Karnak's latitude. The Avebury complex with the largest megalithic standing stone circle and henge, is located one-one hundredth of the planetary circumference from two major archaeological complexes in Ireland, Newgrange and Tara. The distance from Dowth tumulus to Avebury equals 3.602°, from Knowth to Windmill Hill henge 3.600°, and from Tara Mound to Longstones Long Barrow 3.5999°. Figure 4. Avebury Henge and Stone Circles situated at 51.428571° latitude, one-seventh of circumference. At Avebury, the distance to the pole is three-fourths the distance to the equator. 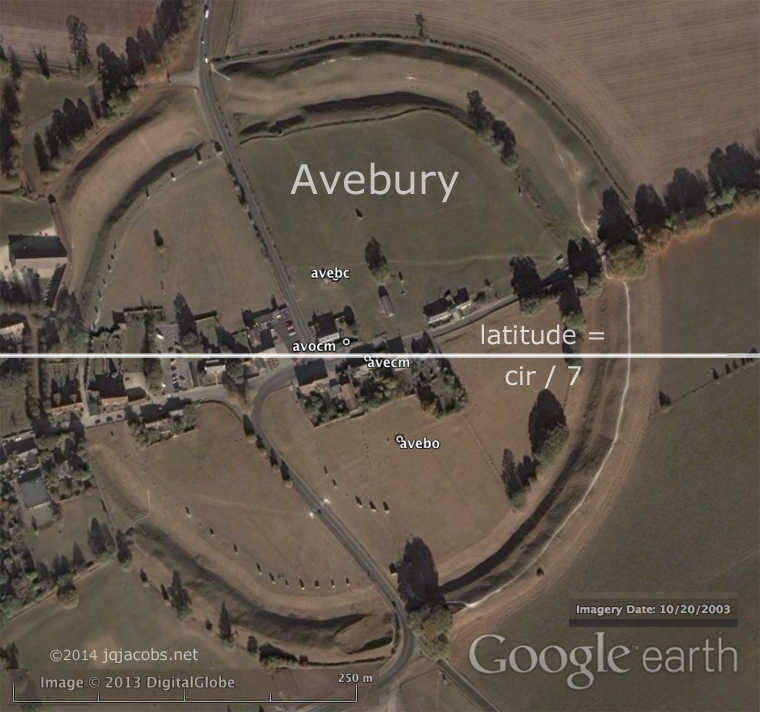 Avebury exemplifies major monument latitude angles subdividing circumference, in this case latitude equals one-seventh of circumference. Further research revealed others. The one-ninth of circumference latitude (40.0°) transects Ankora and nearby the ancient Hittite capital of Hattusha is situated just north of the one-ninth baseline. In Mesopotamia at the Ziggurat of Ur, a known ancient observatory, latitude is a three-to-five triangle (Figure 5). Also in Mesopotamia, the arctangent of three-fourths latitude (36.870°) transects Harran, a major ancient city in Upper Mesopotamia, a center of learning for millenia with known associations to Ur, to astronomy, and, in common with Ur, to the moon in particular. Modern knowledge of trigonometry derives in part from the historical writings by Harran astronomer Al-Battani providing equations for calculating tangents. Thus, a center of learning situated many millenia ago in relation to its trigonometry recently transmitted the knowledge of trigonometry to the West. Figure 5. The arctangent of three-fifths latitude currently transects the site of Ur near the ziggurat. In Africa, the arctangent of three-fifths latitude intersects Sais, the very ancient Egyptian capital in the Nile Delta located an astronomically significant distance west of Ur; their east-west difference equals the arc of mean daily lunar motion. The arctangent of three-fourths latitude intersects Carthage in North Africa. Other Old World monuments coincide with these and other significant latitudes. In the New World, some of the very largest monuments also follow the same placement convention as Cahokia, latitudes where low integer ratios express the geodetic geometry. Cahokia was a late expression of monumentality in the Americas. Early monuments in Peru are contemporaries of the European Neolithic and the early civilizations in Egypt and Sumeria. Recent radiocarbon dating revealed surprisingly deep roots of civilization in the river valley oases of the Andean coast. Aspero, a large early center with platform mounds, has 4,800 to 5,000 years before present carbon fourteen dates from late phase construction. In the Americas, mound construction starts at an early date, well before the pyramids of Egypt were constructed. Watson Brake in northern Louisiana, dated from 5,400 to about 5,000 years ago, is one of the oldest-known, large-scale mound sites in North America. During the chronology of American civilizations, some of the largest of monuments were built precisely at latitudes with integral geodetic triangles. The Casma-Sechin Valley contains the largest concentration of Preceramic period, Initial period and Early horizon sites along the Peruvian coast. The large concentration of Initial period (1800 B.C. to 900 B.C.) 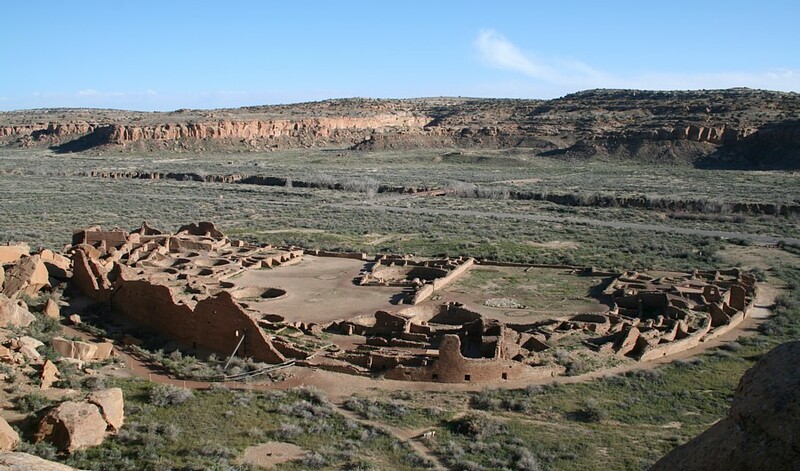 Casma-Sechin monuments is located in the lower valley where the alluvial plain widens and good, irrigable land is found. 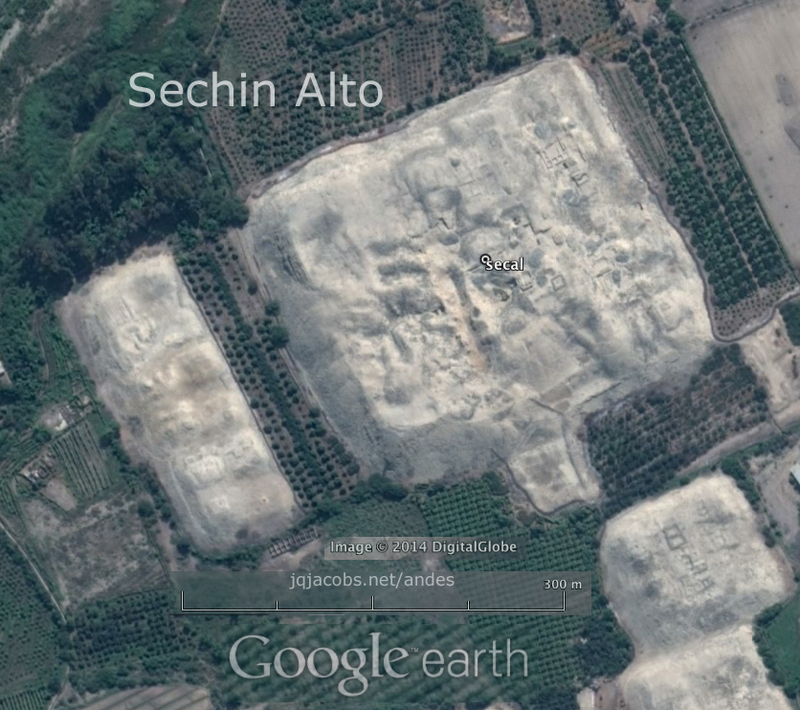 The largest of the Casma-Sechin sites is Sechín Alto with a U-shaped monument plan covering about 200 ha. The baseline where latitude tangent equals one-sixth transects the Sechin Alto complex (Figures 6 and 7). Figure 6. Sechin Alto is one of the largest constructions ever built in Prehispanic America. Five plazas extend 1.4 kilometers from the central mound, three with central sunken courts, one of which is about 80 meters in diameter. The mound was faced with granite blocks, some weighing tons. Sechín Alto's great size may represent a 1,000 year span of building during the Initial period. is the largest single construction in the New World during the Initial period. The Sechin Alto U-shaped complex, the largest monument in a monument-filled district, spans the broad valley. The same baseline, the arctangent of one-sixth (atan 1/6 = –9.4623°), also crosses the Sechin Bajo complex west of Sechin Alto. Just to the north lies Taukachi-Konkan. To the south in the Casma branch of the valley, Huaca Moxeke and Huaca Pampa de Las Llamas form another immense U-shaped complex. Due south is Chankillo, a complex hypothetically associated with astronomy. Just north of Chankillo, latitude equals one-sixth radian. 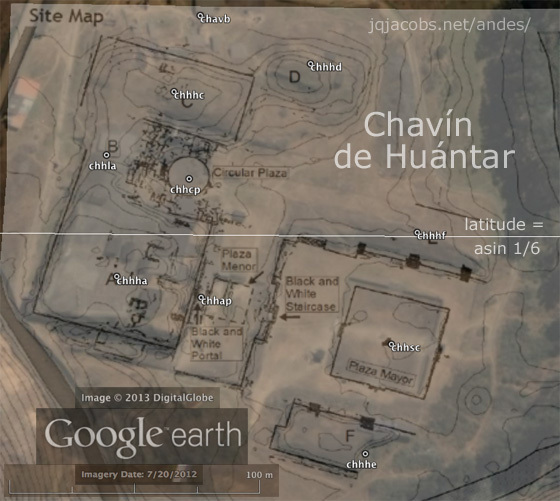 South of Chankillo lies the latitude with sine equaling one-sixth (asin 1/6 = 9.5941°), which intersects a major archaeological complex in the Andes, Chavín de Huantár (Figure 8). High in the Andes to the east of the Casma-Sechin sites, the ancient Andean archaeological site of Chavín de Huantár arose during the Early horizon. Chavín was once compared to the Olmecs and depicted as the Mother Civilization of the Andes. The term Chavín has been applied to a developmental stage of Andean history, to an archaeological period, to an art style, and to a hypothetical empire. Chavín has been interpreted as a culture, a civilization, and a religion. A pan-regional Chavín culture includes attributes of ceramics, architecture, and sculpture. Chavín style, unevenly documented on the coast from Lambayeque to Ica, precedes the first sculptures at Chavín. The coastal sites are older and the style termed Chavín evolved elsewhere and predates Chavín's monumental building phases. Chavín de Huantár, the stone monument complex, also lies on a principal pass from the Pacific coast to the Amazon jungle. Chavín includes a U-shaped principal mound oriented to face the rising sun. The mounds are adorned with finely carved stone sculpture and elaborate iconography and art. A right triangle at Chavin with sides extended to the pole star and to the geodetic center expresses the ratio 1:6; the rotation axis is the hypotenuse equaling six and the geodetic radius equals one. Today, the precise asin 1/6 geodetic triangle intersects the latitude of Building F (the horizontal line in Figure 8). Tectonic motion shifts monument latitudes very slightly, a locally variable factor in proportion to monument age. Figure 8. The arcsine of one-sixth latitude transects Chavín de Huantár. Huaca del Sol, another of the largest New World monuments, is intersected by the arc tangent one-seventh latitude (atan 1/7 = 8.1301°). Huaca del Sol arose along the Rio Moche between 0 and 600 C.E. Most of the Huaca del Sol construction dates from 200 to 400 A.D. 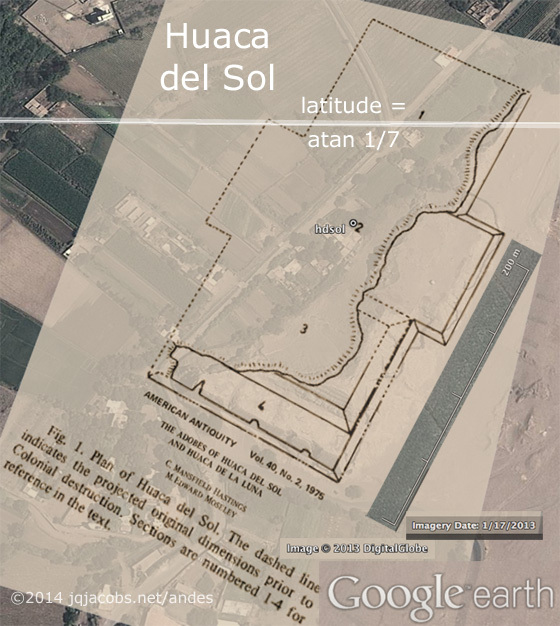 Per Hastings and Moseley, "Measuring at least 342 m by more than 159 m, Huaca del Sol was the largest brick structure in South America." Following the Moche era, the Chimor culture built the largest prehistoric city in South America at nearby Chan-Chan. Most of Huaca del Sol was eroded historically by grave robbers channeling the adjacent Moche river. 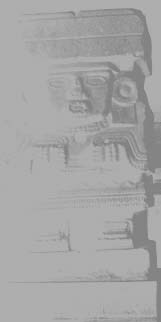 The Figure 9 aerial image presents the outline of Huaca del Sol based on the Hastings and Moseley projected basal form. The horizontal iine denotes the current arctangent of one-seventh latitude. Figure 9. 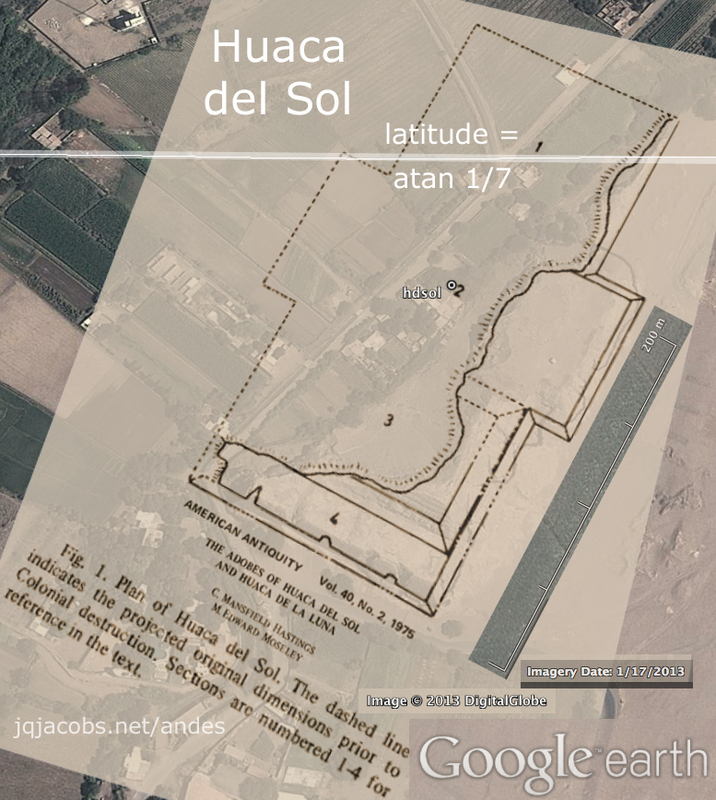 The arctangent of one-seventh latitude transects Huaca del Sol. Ancient Egyptians aligned the Giza pyramids to north. Spence (2000) writes they are "oriented to the cardinal points with extraordinary precision." The polar orientation of Khufu's Pyramid (the Great Pyramid) deviates by less than 3 minutes of arc (one part in 1,146 of its 230m base dimension), demonstrating accurate astronomy and surveying. Spence concluded circumpolar stars were employed to align the pyramids. In Egyptian writing, 'stretching of the cord' and surveying is well recorded and astronomical alignment of monuments is well known. Intentionality of the cardinal alignment of Khufu's pyramid is reasonably accepted. The size of the pyramid provides an extraordinary opportunity to determine ancient accuracy of determining north. However, latitude positioning of monuments in relation to the enormous scale of the earth offers a much more refined assessment of the precision of ancient astronomy. Latitude positioning encompasses the circumference of the earth, a ruler over 40 million meters long in comparison. One millionth the distance from pole to equator is just over 10 meters. The scale of the Great Pyramid, 230.3m long, is just one part in 174,000 of circumference. Hastings, C. M., and M. E. Moseley The Adobes of Huaca del Sol and Huaca de la Luna. American Antiquity 40(2)196. Jacobs, James Q. 1997 Archaeogeodesy, a Key to Prehistory. Jacobs, James Q. 2000 Possible Geodetic Properties and Relationships of Neolithic Monuments of the British Isles: A Preliminary Inquiry. Jacobs, James Q. 2001 Early Monumental Architecture on the Peruvian Coast. Malville, J. McKim, Romauld Schild, Fred Wendorf, and Robert Brenmer 2007 Astronomy of Nabta Playa personal communication. Moore, Jerry D. 1996 Architecture and Power in the Ancient Andes: The Archaeology of Public Buildings Cambridge University Press. Moseley, Michael E. 2001 The Incas and their Ancestors: The Archaeology of Peru Thames and Hudson, London and New York. Petrie, W. M. F 1883 The Pyramids and Temples of Gizeh Field & Tuer, London. Pozorski, S. G. and T. G. Pozorski 1987 Early Settlement and Subsistence in the Casma Valley, Perú. University of Iowa Press, Iowa City. Quilter, Jeffrey 2013 The Ancient Central Andes. Routledge. Quilter, Jeffrey and Michele L. Koons 2012 The Fall Of The Moche: A Critique Of Claims For South America’s First State Latin American Antiquity 23(2):127-143. Spence, K. 2000 Ancient Egyptian chronology and the astronomical orientation of pyramids Nature 408:320.
" 11 Ahau was the katun when they carried on their backs. Then the land-surveyor first came; this was Ah Ppizte who measured the leagues. Then there came the chacté shrub for marking the leagues with their walking sticks. Then he came Uac-hab-nal to pull the weeds along the leagues, when Mizcit Ahau came to sweep clean the leagues, when the land-surveyor came. These were long leagues that he measured. ..."
THE BOOK OF CHILAM BALAM OF CHUMAYEL, Ralph L. Roys, 1933, Carnegie Institution Washington D.C. The Geodesy Page, definitions, figure of the earth formulas. with monuments, mounds, pyramids, and sites worldwide. constants, obliquity of the ecliptic, eclipses, more. are all situated on an approximate north-south line near the 108th meridian. Your comments, etc. are appreciated. Contact and Permissions. ©2014 James Q. Jacobs. All rights reserved.